This photogenic channel provides a liquid corridor between mountains, forests and rocky islands filled with marine birds and animals. We suggest a half-day kayak tour of these waters before finishing with a well-deserved rest in local hot springs. Activity Type: Guided kayak excursion. Distance: 6.5 nautical miles of navigation. Special Considerations: Looking for more activity and adventure? You can combine this excursion with 6 kilometers of mountain biking, going from town to the Termas del Ventisquero Puyuhuapi, and then return to town via kayak after relaxing in the thermal baths. Reservations: This excursion requires advance coordination. Services: In Puyuhuapi, you can contact: Experiencia Austral, Otto Ubel #36; (09) 87448755; adonisgam_7@hotmail.com; contacto@experienciaustral.com;www.experienciaustral.com. The experience of touring by kayak is unique, especially when the Puyuhuapi Fjords become calm and all of the colors and reliefs of the mountain are reflected on their surface. Sitting even with the waterline, everything takes on a new perspective; the constant movement of the waves, the silent movement of the boat and the coast with its forests and beaches, keeping watch over everything from the distance. On these days, we would describe the experience of kayaking this Fjord with a single word: tranquility, just you, your paddle, your boat of approximately 4 to 5 meters, and nature. 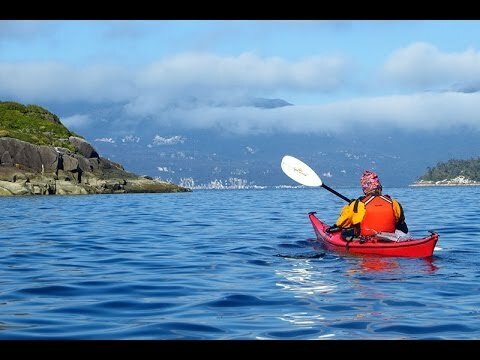 Paddling the fjords offers opportunities to watch sea lions, dolphins, and both coastal and forest bird-life, because the vegetation on the islands is so lush that all the forests extend to the sea. Begin your adventure in Puerto Puyuhuapi, a quaint village founded in 1935, joining German and Chilote heritage. The town was founded on the edge of the fjord by four immigrants from what is now the Czech Republic. They came to Patagonia in hopes of leaving behind the threat of impending war in Europe, bring with them a great spirit of adventure and a love for nature. Their initial idea was to inspire other families to join them as soon as possible; however, the Second World War delayed their plans until 1947. Meanwhile, they worked to develop the port, bringing in master carpenters and wood-workers from the island of Chiloe to assist with the daunting task of developing a colony in the middle of such a remote and indomitable landscape. Today, Puyuhuapi offers a fusion of cultures, reflected in the architecture and a gastronomy that borrows from both heritages, mixing fish and currant with German-style küchen and asados. If you’re not traveling with your own equipment, the best way to kayak the Puyuhuapi Fjord is with a licensed operator, who will provide the right equipment and a guide familiar with these waters. As long as you are willing to follow the directions of your guides, this activity is even suitable for beginners. The excursion starts at the docks in town, where you’ll meet with your guide to organize and prepare your gear. Around 09:00, you’ll enter the water and start paddling the Puyuhuapi Channel, which is also known as the Cay Channel. This channel connects with the Jacaf Channel and then the Pacific Ocean to the north and to the south, where there is direct access to the open Pacific seas. Along the Puyuhuapi Channel, you’ll note various activities associated with salmon farming, which it one of the major economic activities in this area. Donning your neoprene wet-suit and other protective gear, you’ll begin to paddle along the northern shoreline, with the Carretera Austral always to your left. During the tour you will observe a large variety of birds, like black-necked swans, cormorants, herons, kingfishers, petrel and Magellan penguin, in addition to sea lions and austral dolphins, also known as toninas. Since you are in kayak, your tour will be extremely quiet, causing less distractions and fear amongst the fauna and rewarding you with the possibility of being much closer than you would be able to achieve in boat. During the tour you will see the group of volcanoes that rise up all around Puyuhuapi and a little later, an unforgettable panoramic view of the Queulat Hanging Glacier from the Puyuhuapi Fjord. In this sector there are thermal waters that spring from the rocks, and mix with the sea. You can leave your kayak on the nearby beach and soothe tired muscles with a well-deserved rest in their relaxing hot waters before returning to Puerto Puyuhuapi. In addition to panoramic views of the Puyuhuapi Fjord and Queulat National Park, Puyuhuapi is full of unique heritage that mixes the traditions of Germany and Chiloé. It?s the perfect place to explore on two wheels.